No. 5 Texas Volleyball defeated Texas State, 3-0 (25-14, 25-17, 25-14) at Gregory Gym on Friday night to advance to the program’s 31st 2018 NCAA Sweet 16, and 13th in a row. 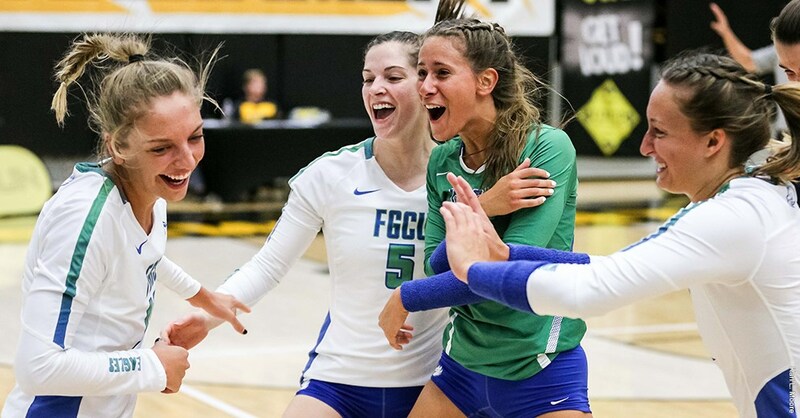 ORLANDO, Fla. – In its first-ever NCAA Division-I Tournament match, the FGCU volleyball team (27-6) knocked off 13th-seeded UCF (27-4) 17-25, 25-22, 25-23, 14-25, 15-7 in the first round on Thursday. The Eagles will now face AVCA No. 16 Florida (25-6) at 7 p.m. on Friday at The Venue on UCF’s campus for a trip to the round of 16. The only meeting between the two teams came on Aug. 25, 2012 with the Gators picking up a straight set win on their home court. The victory represented several milestones for the Green and Blue. UCF, playing on its home court, entered the match ranked No. 21 in the latest AVCA rankings and No. 10 in the RPI, which means FGCU picked up the program’s first win over a ranked team in its 13th try. It also extended the team’s winning streak to a Division-I era record 16 straight, while snapping UCF’s streak at 24. On top of that, the team’s 27 wins ties the 2016 team for the most wins in a single-season in the Division-I era. Offensively, FGCU was led by Cortney VanLiew, who had 25 kills, 12 digs, two block assists and one ace, while Snowy Burnam produced 15 kills and a career-high 26 digs. Meanwhile, three others also tallied double-doubles – Maggie Rick had a team-high 27 assists along with 11 digs and four kills, Dana Axner had a game-high 29 digs and a career-high 11 assists, and Chelsey Lockey (Eaton, Colo./Eaton HS) had 18 assists and 12 digs. Outside of those five, Giovanna Borgiotti had seven kills, while Daniele Serrano (Sanford, Fla./Seminole HS) and Sharonda Pickering each produced four blocks. Tori Morris (Virginia Beach, Va./Floyd E. Kellam HS) chipped in three blocks. With her offensive production, VanLiew (Seymour, Ind./Columbus East HS) has now recorded 470 kills this year, which is second all-time and 16 shy of breaking Amanda Carroll‘s (Albuquerque, N.M./Sandia HS) single-season program record of 485 set in 2016. Her 25 kills is tied for the ninth-most in a match and her 79 attack attempts is her second-most of the season (80 vs West Virginia, Sept. 8) and the third-most in a match all-time (Ana Kokanovic, 85, Nov. 1, 2008). Meanwhile, Axner (Dublin, Ohio/Dublin Coffman HS) broke the program’s single season digs record with her 607th and final one of the match, surpassing Whitney Hendry‘s 606 from 2005, which occurred in the program’s Division-II era. Her total also has the freshman 14th in career digs just 33 matches into her career. Her double-double was a career-first. In the opening set, UCF jumped out to a 10-4 lead, pushed it to as many as eight and never trailed to take the lead. FGCU responded by scoring the first three points of the next set, punctuated by a kill from VanLiew. The lead grew to eight 13 points later, although UCF trimmed the deficit to 19-17 late in the set. Borgiotti (Vienna, Va./George C. Marshall HS) answered with a kill to spur a 3-0 run. VanLiew and Burnam (Palm City, Fla./Jensen Beach HS) added two kills late before Pickering (Sea Cow’s Bay, Tortola, British Virgin Islands) evened the match with a right-side kill. The momentum continued in the third set for the Green and Blue as they scored three of the first four points. UCF bounced back to take a 6-4 lead, but a free-ball kill from Axner spurred a 4-0 run as the Eagles took a 10-7 lead. The Knights rallied to tie it at 11, but VanLiew, Pickering and Burnam each recorded kills during a 7-0 run. UCF rallied to even it up at 22 apiece, but VanLiew responded with a kill, followed by a UCF ball-handling error. Rick (Alpharetta, Ga./Blessed Trinity Catholic HS) then ended the set with a dump kill to give FGCU a 2-1 lead. In the fourth set, UCF scored the first three points, led by as many as 10 and never trailed en route to forcing a deciding set. FGCU scored four of the first six points in the fifth and reeled off four straight moments later, highlighted by three kills from VanLiew, to take an 8-3 lead into the side switch and media timeout. Burnam added another kill to make it 10-5. A successful attack from Borgiotti, followed by back-to-back attack errors from UCF, made it 13-6. The Green and Blue then got another kill from Burnam before capturing the match on an attack error by the Knights. Interestingly, UCF’s last loss came on Sept. 2 in a four-set decision on the road to then No. 4 Florida. The second-set victory for FGCU represented the ASUN’s first NCAA Tournament set win since Jacksonville took a set from Florida in 2013. The victory was the conference’s first since UCF defeated Cincinnati in five sets in 2003 when the Knights were a member of the ASUN. The Eagles are now the only current ASUN school with an NCAA Tournament victory. ORLANDO, Fla. – The historic 2018 season came to a close on Thursday night for the No. 21 UCF volleyball team. The Knights (27-4) fell in the First Round of the NCAA Volleyball Tournament in five sets to FGCU. The loss spelled an end to landmark career of Jordan Pingel, easily the best libero and one of the top players in program history. The Colorado Springs, Colo., native left it all on the court for the final time, recording 26 digs on then night. With her second save of the evening, Pingel broke the single-season digs record. The single-season and career digs champ at UCF finished with 597 on the year and 2,262 for her four seasons at UCF. McKenna Melville turned in her 22nd double-double of the year. The American Athletic Conference Freshman of the Year went for 24 kills, 16 digs and three blocks. Nerissa Moravec matched her career high with 11 kills at a blistering .526 attack percentage. The redshirt sophomore also led the way, along with Amber Olson, with five blocks. Olson had the lion’s share of setting duties with her 10th double-double of the year, a 42-dime, 15-dig performance. Alli Sabol also stepped up in a mixed setter-right side role. The Dublin, Ohio, native notched 10 assists with three digs and one block. UCF took a monumental step as a program in 2018. After a fifth-place finish last year in The American, the Knights turned to the youth movement, starting most matches with six underclassmen and anchored by the senior leadership of Pingel. After a 3-3 start, the Knights did not lose for the remainder of the regular season, a span of 24-matches. Their perfect 18-0 mark in The American brought a second title to UCF in the last five years. Melville, Pingel and Kristina Fisher were all named to The American First Team, and Anne-Marie Watson earned a spot on the league’s second team. The Knights set the single-season block assists record and earned the first ranking by the AVCA Coaches Poll in program history. That all culminated in the first national seed and hosting duties for the NCAA Tournament. Pingel’s graduation will leave a tremendous void in the back row and in the locker room that rising seniors Erin Olson and Alli Sabol will need to meet. UCF returns its entire offensive and blocking output for 2019. The future is bright for the Knights, and the 2018 season is just the start of an upward movement that will see UCF raise to the national stage. >> In the first NCAA Tournament match hosted in The Venue, the Knights set a new attendance record with 1,774 fans through the turnstiles. >> The Black and Gold totaled 13 blocks, marking the 15th time the Knights hit double figures at the net. >> The Knights’ 24-match winning streak was the fourth longest and the longest DI record in school history. >> The 27-4 mark on the year was the best record for UCF since a 28-4 spot from the 1997 season, which also ended in the NCAA Tournament.